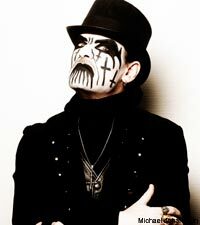 "This process has been an education on technical file compression, aspect ratios and noise reduction," the inimitable King Diamond exasperatedly told Noisecreep about the reissue series he worked on for Metal Blade. The King has clearly been immersed up to his eyebrows with this project, getting his hands dirty and working directly on all aspects of the project and his command of the vocabulary and the jargon only proves that! "These four remasters have taken up some time," King added. "I've been working on the old footage that is bootleg, but we have good equipment so we can enhance the footage quite a bit. There will be a three DVD set and maybe even four-disc DVD set of Mercyful Fate." That's a whole lotta King Diamond, but his legion of fans are sure to be pleased. "We're almost halfway through it, but it's a bigger project than I ever expected. We have a strong computer and we have footage, will enhance it and it will be killer, better than any bootleg and it's rare, since a lot of it is our own." Those who purchase the reissues and next year's Diamond/Fate DVDs will be happy to know a lot of King's blood, sweat, tears and other bodily fluids went into the project. He revealed, "There was a lot of editing, but to get it to work was a nightmare. The footage is from 1990, and it's not the oldest, but it's old and there were Super 8 tapes that I used back then were put on VHS to preserve them back then; then to DVD, then someone was making me copies of that, that I couldn't play them here. We had to call to specialists and go through formats and files. We took everything apart and put it back together. There is lots of troubleshooting, and not a lot of progress." The reissues of 'Spider's Lullabye' and 'The Graveyard' were released Oct. 13. 'VooDoo' and 'House of God' are out Nov. 11.